The owner of a trucking firm has a collection of hideous pictures, emergency room visits, a broken jaw and missing teeth, courtesy Boblitt says, of her former husband, Steven B. Boblitt. 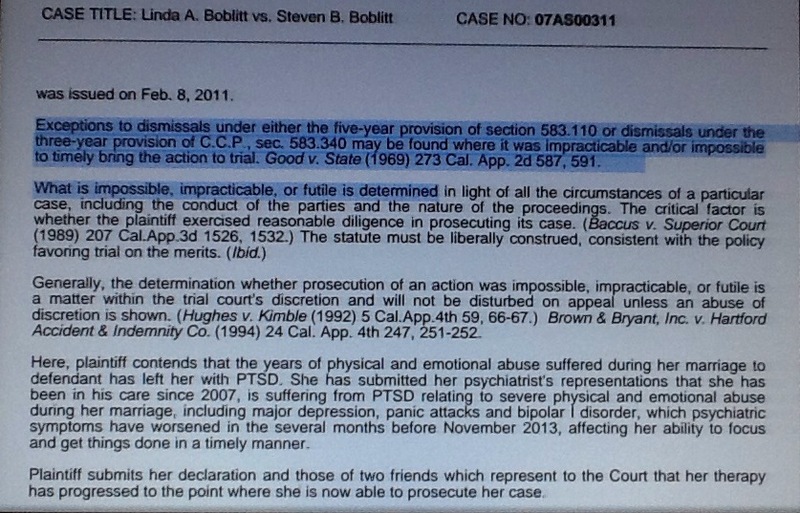 Yet Boblitt continued her search for justice. Last week finally yielded a little light in the shadow of what routinely passes for “justice” in family court. Years too late, given Family Court Judge James Mize’s amazing “not credible” comments. But it’s a start. Naturally Linda Boblitt’s win wasn’t in Family Court. 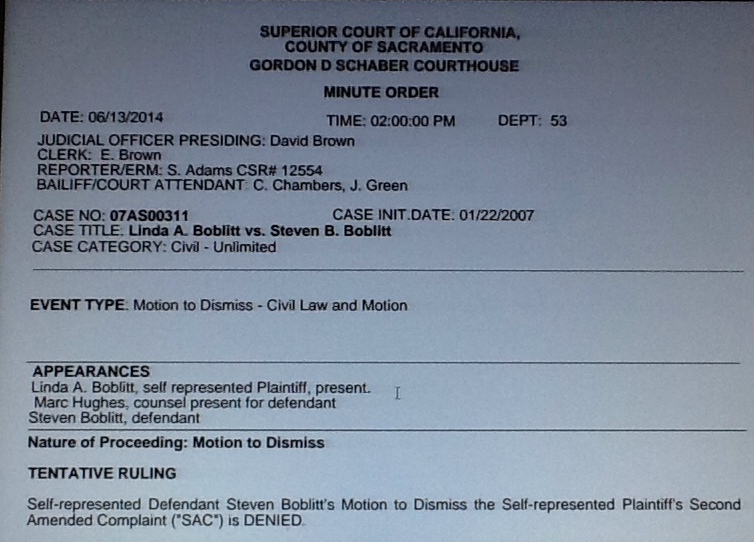 Boblitt prevailed in the Law & Motion Department of Civil Court against Steven B. Boblitt’s Motion To Dismiss. 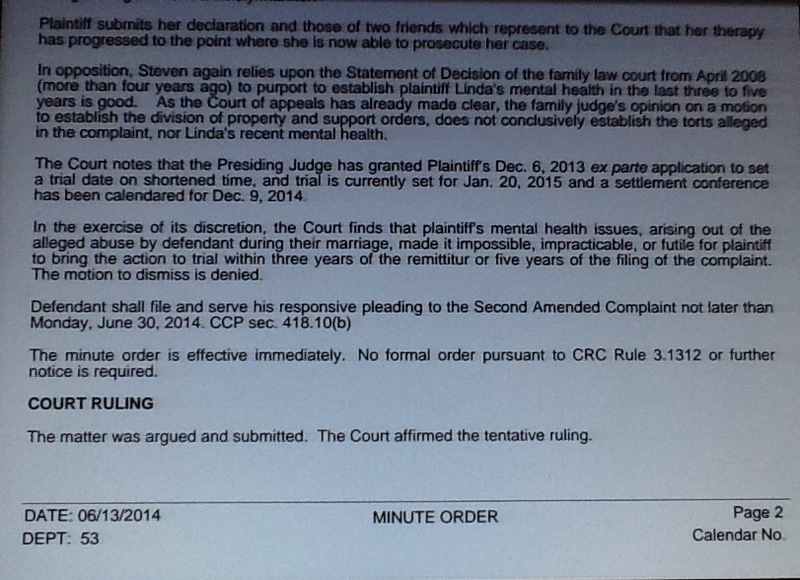 Linda defeated Steven Boblitt, and his on-again, off-again, “Special appearance” attorney, Marc Hughes. But, I digress. Key word below is the last word in the second paragraph: GRANTED. Marc Hughes made a rote defense. But it would appear David Brown, the judicial officer hearing the case, applied the “man on the street standard,” the common sense standard largely absent in these type of cases. Women continue trudging for justice largely devoid of media exposure. Reporters and talking heads still have not really gotten the message. Including after the defeat of Eric Cantor, (which came as no surprise to the women working to defeat him). Perhaps the talking heads might tilt their heads in the direction of voters. Women voters. Women voters who vote more than men. Perhaps they might consider how many worked so hard, (full disclosure: I was one of them) to defeat long-time LA Family Court Commissioner, Debra Losnick. 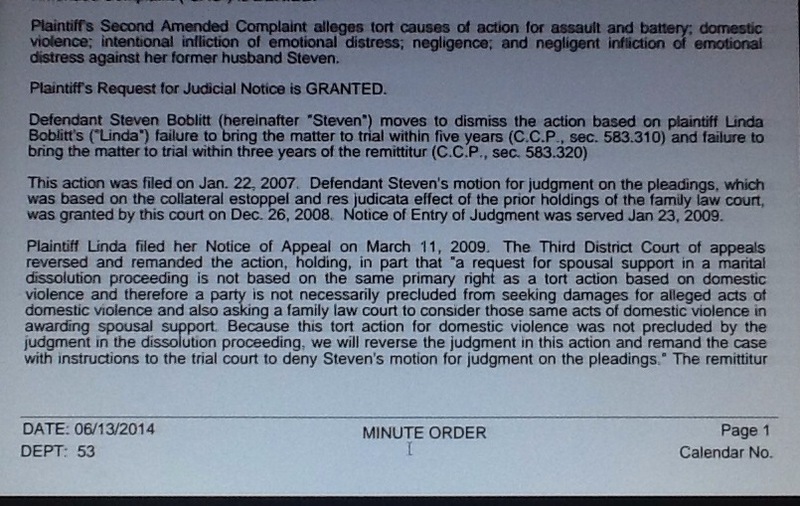 This entry was posted in Law, Politics and tagged domestic violence, Linda Boblitt, Linda Boblitt defeats Statute of Limitations Dismissal, Marc Hughes, Steven Boblitt. Bookmark the permalink.